To streamline the repair process for the 900 Chromebooks at the high school and the middle school, a new repair process is now in place. The repair process starts with the student visiting the repair kiosk set up in their respective building. The student will need to complete the Google form that will be shown at the repair kiosk. 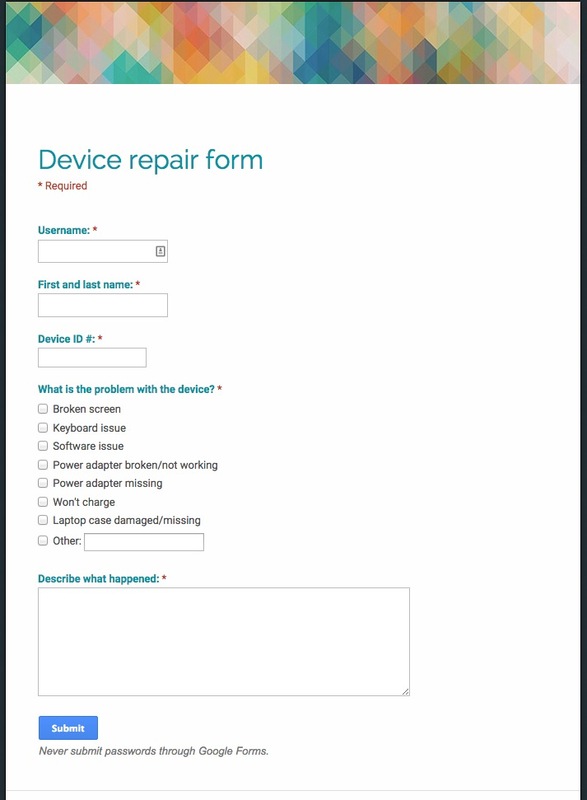 If the repair kiosk is not available, the form is available here. After the student submits the form, an email will be sent to the student with the information from the form. A help desk ticket is also created. The student will then leave the Chromebook with the responsible teacher or secretary. Each building will have loaners available to be used by students while their Chromebooks are being repaired. The loaner Chromebooks will not go home with the student. Once the help desk ticket is created, a representative from the technology department will collect the Chromebook and attach a copy of the repair form. A decision will be made by the technology department on whether the device will be repaired locally or sent in to Xtek to be repair. The decision will be noted in the help desk ticket. Once the machine is repaired, an invoice will be generated by the secretary based on the cost of the repair and if insurance was purchased. A copy of the invoice will be given to the student and any costs will be entered into DASL for collection. If insurance covered the cost of the repair, the student will be informed that they will need to purchase additional insurance if they want the next repair to be covered.